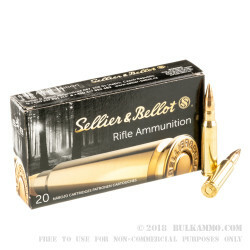 Sellier & Bellot is a well-known producer of military cartridges for sale to law enforcement, military and civilian markets for a wide range of uses. This is their 147 grain .308 Winchester load that features a full metal jacket projectile and a brass cartridge casing with a boxer primer. The reloadable casing is of top quality and is highly sought after by reloaders due to the makeup of the case. The Czech Republic based company is a top producer, volume wise for many European sporting cartridges, and the .308 Winchester load is a popular option in their product line as well. The quality of the rounds that come off of their machinery are usually among the highest anywhere in the region, and are very competitive with the top US producers. 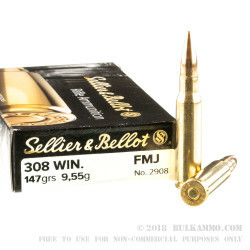 This is a round suitable for most jurisdictions for large game hunting and offers a static ballistic profile of 2808 feet per second of velocity and 2580 ft. lbs. of energy out of the muzzle. Check your local and state hunting regulations to be sure a lead based full metal jacket round can be used for the game you are seeking after. This is an excellent round for sporting purposes as the price point is very competitive given the accuracy potential for 1MOA and the quality of the build. 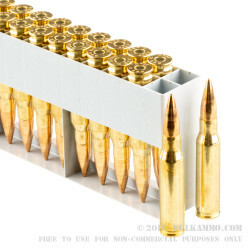 This product is a single box of .308 ammunition with 20 rounds inside ready to fire. 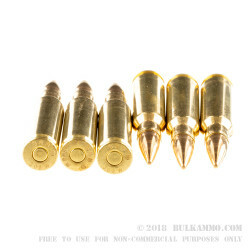 If you need a lot of ammo, check out the bulk case of 1000 rounds for sale here. Got this quicker than expected by rather inexpensive shipping - great deal! Shot in a cold (25oF) with moderate wind at target on 70yrd (could not get any further - snow) prone from bipod using Tikka T3 SS varmint. Shot ~40 rnds in strings of 3. group size was from 1/2" to 2/3". Patch upon cleaning came out almost clean! Weighted each cartridge from one box on precision balances -- the difference between rounds is no more than 20mg!